Further details of these improvements are given below. Users of MST Radar data are encouraged to switch to the v4 Cardinal data files. Please contact the NERC MST Radar Facility if v4 files are not available for the dates that you are interested in. The v4 data processing scheme currently uses v3 Cartesian data as input. It is consequently possible to generate v4.0 files for (almost) any date for which v3 files already exist. The v4 scheme will eventually be extended so that it can process data from the spectral level upwards. The v3 data processing scheme - described by Hooper et al. (2008) - was designed to produce the best possible estimates of winds based on measurements made during a single cycle of observation (which typically lasts for just over 5 minutes). As can be seen from the figure below, the representativeness of these estimates can be improved by smoothing the data in time. A statistical analysis has shown that the optimal level of smoothing is approximately 6 cycles (31.4 minutes) for tropospheric altitudes (further smoothing can reduce the random error slightly for stratospheric altitudes). Consequently the v4 Cardinal files contain wind components that have been smoothed over a nominal interval of 33 minutes (which allows for small variations in cycle duration). A side effect of smoothing the wind data in time is that it fills in short data gaps. 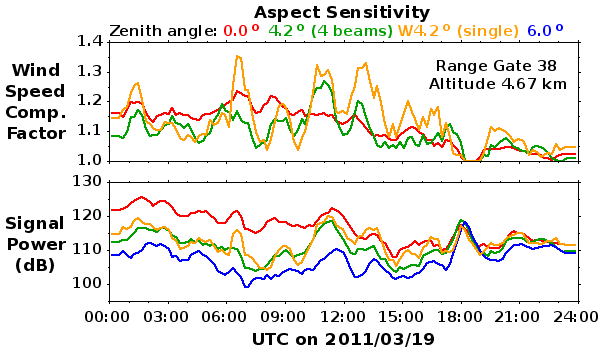 This also applies to the beam-broadening corrected (vertical beam) spectral widths, since they rely on the wind speed as well as on the raw vertical beam spectral widths. However, the numerical difference between using smoothed (v4) or unsmoothed (v3) wind speeds to correct the spectral widths is only apparent where the raw spectral width is marginally greater than the beam broadening contribution. Where the raw spectral width is significantly greater, the difference is negligible. The term aspect sensitivity refers to the decrease in radar return signal power that is often seen with increasing beam pointing zenith angle. This causes an off-vertical beam to be weighted more heavily on its lower zenith angle side than on its higher zenith angle side. The beam's effective zenith angle will consequently be slightly smaller than the nominal value and the magnitude of the horizontal wind component will be correspondingly underestimated. A compensation factor for this effect can be derived from the ratio of the signal powers observed at two zenith angles. This factor has already been applied to the wind components in the v3 and v4 data files and its values are included simply for reference purposes. The v3 processing scheme uses signal powers at zenith angles of 4.2° (from a single beam - orange line in figure above) and 6.0° (from the mean of four beams in orthogonal azimuths - blue line). Owing to the small difference between these angles, the compensation factor (orange line) is highly sensitive to small variations in the signal power ratio. Moreover, the use of only a single beam pointing direction at 4.2° off-vertical neglects any variations in signal power as a function of azimuth. Values based on the mean signal power from four beams at 4.2° off-vertical in orthogonal azimuths are shown (green line) for reference. This figure uses data from a special campaign period when observations were made in all 17 available beam pointing directions. The 3 additional beam pointing directions at 4.2° off-vertical are not available during standard observations. The v4 processing scheme reduces the significance of these limitations by using the ratio of signal powers observed at zenith angles of 0.0° (red line) and 6.0°. Users should therefore expect slight differences between the horizontal wind speeds derived from time-smoothed v3 data and v4 data. More details about aspect sensitivity and the wind speed compensation factor can be found in the following publications: Hooper and Thomas (1995), Thomas et al. (1997), and Lee et al. (2014). Page maintained by David Hooper. Last updated 15th May 2017.